On November 11th at 2pm at the age of 29 years old I had a fasciatomy and excursion of a calcification in my Right foot/heel. I am going to go through and answer all of these questions and update it every two weeks as i feel there are not enough personal first hand accounts out there. 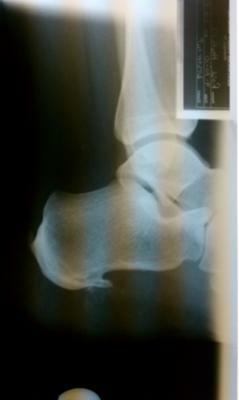 I am including an x-ray also of my foot 3 weeks prior to the surgery. 1. How long had you been having foot problems? When I was 23 years old I came down with Plantar Fascitis. I was working out pretty hard, and had dropped from 260 pounds to around 190 pounds within about a year and a half. I believe the problem was caused by not only working full time on a shop floor, but my workouts...i remember feeling a RIP while doing a set of bleachers, and thinking it was like any other normal injury thought it best to work out through it. I ended up getting the glass shards through the heal feeling about a month later... Since then i have had several cortizone injections, and orthotics. It went away after about 9 months. Recently in April of 2010 at the age of 29 I started getting a bruise on the inner part of my heel. It felt like a bone was coming through the part of my foot. The pain was unbearable at work (I work as a manufacturing associate and stand on concrete full time). An xray showed that I had a calcification form underneath a bone spur. The bone spur was not causing the problem -- the calcification was. After 2 injections, 3 weeks off work, Surgery was decided on. 2. How severe was the pain and problem? The Plantar Fascitis was quite severe at work.. I was limping quite bad. The Calcification was even worse... as quoted before... I work 2nd shift.. around 8pm at night (6 hours into my shift) it hurt quite bad. Midweek a bruise would form. It literally felt like a bone was coming out the side of my foot. Starting in April I couldn't even workout anymore. 3. What was the experience of the actual surgery? 4. What was the recovery like? 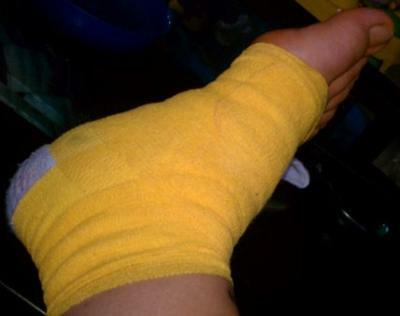 it hurt pretty bad (my foot was numb and swollen) but by the morning the swelling had gone down. Thursday (today is Monday 11/15) i have a changing of my dressing and more instruction. I can walk on the ball of my foot now (i started about Sunday with this). The worst pain is at night after the meds wear off I can feel the stitches. 5. How long has it been since the surgery, and how are you now? 5 days. I will update this later. My big toe twitches every once in awhile which send a pain through my heal... but other than that things are not as bad as I had anticipated. No throbbing. just really uncomfortable when I try to walk on it. My idleness and boredom worry me the most. Mentally fine, but reading worst case scenarios on this surgery tend to freak me out. Hopefully the odds are in my favor. I've read there is a 75-90% success rate. I couldn't do any of the things I loved for the past couple of months, and hopefully after this heals I can continue to do the things I love. I'm trying optimism out for once. Thanks for sharing, and I'd love to see updates! You may want to learn about Magnesium for Tendonitis. Specifically, when you're low on magnesium your body will excrete calcium. This explains Calcific Tendonitis, and may explain why you had such a large growth on your foot. Tendonitis in general and Plantar Fasciitis specifically are DYNAMICS. There's a lot going on. You're going to want to lengthen/open up the tissue of your lower leg as part of your rehab. That tissue reaches down into the foot. 1. Where did you feel the rip? 2. What rehab advice/plan did you get from your doctor?